Quantico is a knowledge organisation. Our primary focus is on teaching, researching, publishing, and implementing communications strategies and practices for regional economic and social cultures. Our work helps government, public and private firms, institutions and entities make well-timed, well-informed communication choices. Our approach made us a leader in our field. Today it’s keeping us ahead of it. We are making copywriting and content skills accessible to every individual, entity, and organisation. We believe our customers deserve quality learning, delivered in an environment that is secure, welcoming, and conducive to knowledge exchange and idea development. Our customers choose to learn relevant skills that advance self-confidence, personal development, and professional growth. Our workshops and courses promote a spirit of education and lifelong learning that translates across the boundaries of age, culture, and nationalities, to embrace a global race empowered by education. The more we share our knowledge, the better it gets for everyone. 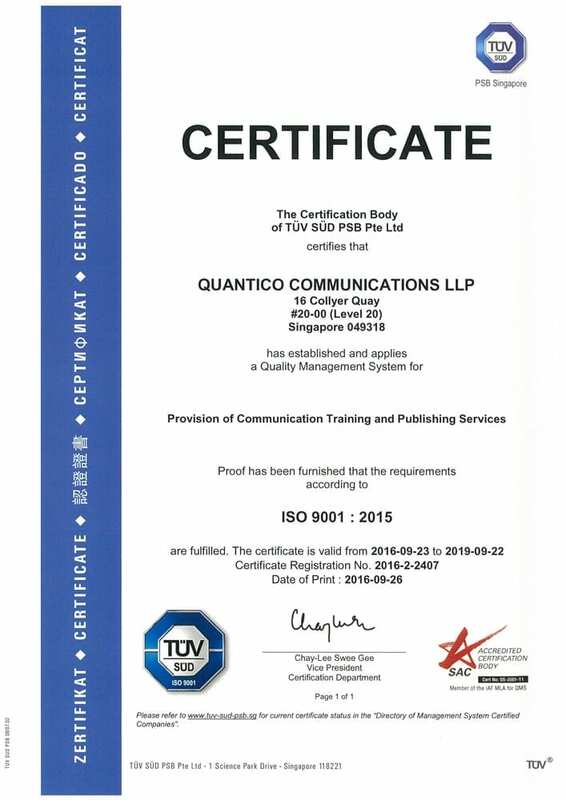 Quantico is an ISO 9001:2015 certified organisation; we are fully committed to the highest international quality standards for every workshop and course we conduct in Singapore and in the region. Quantico’s workshops and courses are crafted on the premise that what you write, and how you write, can change the minds of your audiences about your organisation, your brands, and your content platforms. Your workshop tools also provide the foundation for developing your cross-disciplinary skills in related fields of design-thinking, social communication, and public engagement. Throughout your workshop, you will have the opportunity to build on your own case studies, and apply your learnings towards building phenomenal content. We are opening new frontiers and building mission-critical abilities through Quantico’s Workshops + Courses in Singapore and the region. Your writing has the capability to convert consumers to customers. In other words, your words possess unlimited potential to change someone’s world. While many of us will know how to write copy or have some experience creating marketing campaigns, formally learning the rules, and the tools, of professional writing gives you far more options to extend your content’s influence. Your workshop groups are kept small to maximise individual attention so we can deep-dive into each of the principles of effective content creation, and answer why copywriting works so well, and for so few. Working With The Best + Brightest. How we serve our customers determines the nature of our firm. At Quantico, we are committing to quality by providing our customers with rich learning experiences, built on a culture of attentiveness, care, tolerance, kindness, and affability. We want our customers to count boldly on us for value in all that we undertake, and to consistently hold us to worthy standards that will exemplify the spirit of service, trust, and dignity. These are the characteristics of the customer journeys we create, every day, at Quantico. Quantico is committed to providing customers with exceptional workshops and high-quality solutions through experiences of genuine service, warmth, and care. We achieve excellence in our services by exceeding the requirements of our clients, meeting our contractual requirements, and continually improving the overall effectiveness of our Quality Management System. Quantico makes a very valuable difference to your brand’s communication, by providing concept-driven writing that speaks to the broadest possible spectrum of audiences. We work in every medium, from print to digital, to craft written communication experiences that deliver measurable value to your brand. Quantico began as a startup from a select handful of highly experienced web and traditional media copywriters who are choosing to create rich communication experiences. 12+ years later, we are still strong believers in producing genuine, original work that expresses and impresses. We’re still bringing bucket-loads of quality and passion; only now it’s tempered with age and experience. Quantico comprises a highly skilled, hand-picked team. This allows us the liberty and luxury of doing all our work in-house. We do not outsource. The entire firm comes together for every project so, as our client, you enjoy the security of a team of several experts crafting and refining your work. Every team member at Quantico is excited to be making written and verbal communication work to its best. Quantico is a purveyor of fine written communication for traditional print media, websites, and digital and mobile platforms. Our focus is on copywriting, editing, research, conceptualising and providing healthy content strategies to organisations who want to supercharge their communication. We care a lot about this stuff. Quantico’s copywriters, editors, and designers create pieces of communication that are constantly meeting two key requirements: to fire up the imagination of all our target audiences by imputing interest, and to distill each piece of communication to its finest form across web, digital, and traditional media. We’re still bringing bucket-loads of quality and passion; only now it’s tempered with age and experience. Quantico’s goal is to make content appealing and influential. Organisations work closely with the firm to articulate their ideas, to increase their desirability, and to also express what matters to their business. We create written communications that help organisations to understand and be understood by their customers By doing this, we are extending the capacity of entities and organisations to inspire and influence people. Our workshops and courses are built from proprietary tools that were fully developed in-house at Quantico, to establish quality and consistency from concept to classroom. Your workshop is constructed and facilitated by Quantico Lead Instructors. Lead Instructors have the requisite 11 years experience, plus have either won awards in their respective workshop zones and/or are directly pegged to the ISO 9001:2015 framework within Quantico to develop workshops for Asia-Pacific market needs. Your workshop is customised to your most specific details, regardless of size or intricacy. Sometimes, though, you’ll want a little help getting started. Your workshop is future-proofed and region-secured through a series of research and trend-spotting methods that keep your organisation ahead of its markets. We listen to and understand your goals. Then we put these goals through our internal surveillance audit to ensure that your learning tools are relevant and valid for a minimum of four years. Your workshop goes beyond its start and end dates. Quantico’s Lead Instructors help you understand your choices so you can make informed, unbiased decisions that are truly beneficial to your teams and your organisational learning requirements. At Quantico we’ve reinvented the bar on innovating lifelong learning support. We believe it’s not enough to rely on just your notes after your workshop ends. That is why your Lead Instructors will remain on hand to provide you with best-in-class post-workshop support.